Have you noticed some Facebook Pages have a Locations tab? That’s usually because each location (child) of the main company (parent) also has a Facebook Page. If you have many locations, such as doctors’ offices, hospitals, clinic buildings, and more, that’s a LOT of pages to manage! Take Starbucks, for example. 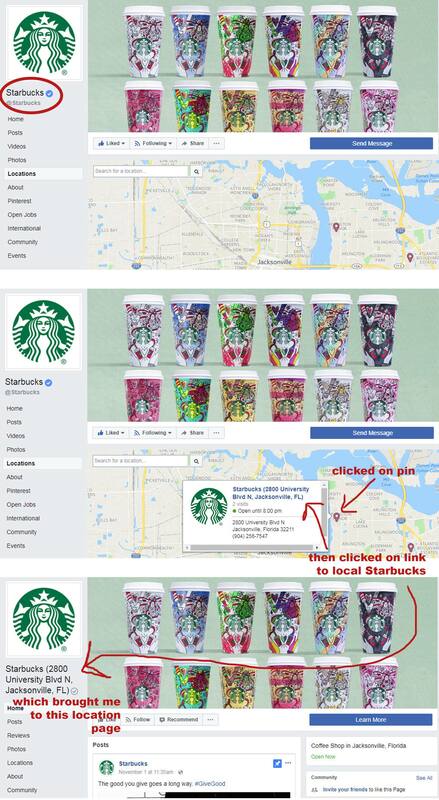 There is a way to show your locations on a map without creating Facebook Pages for each location. 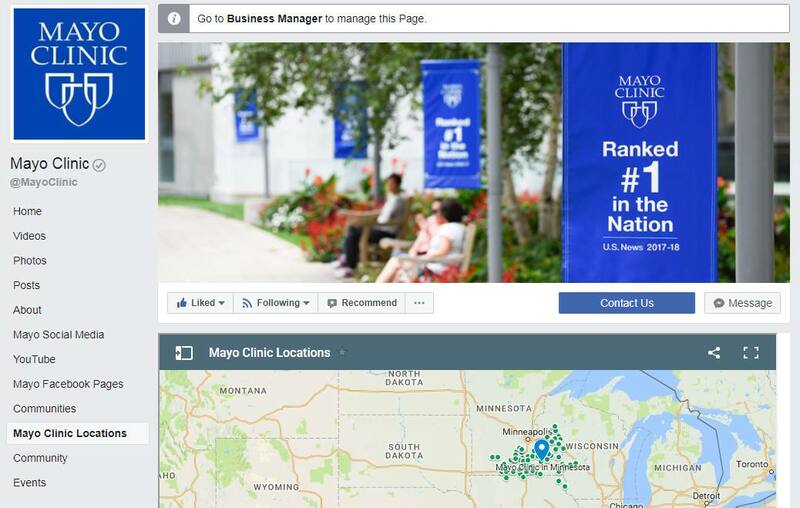 Take a look at our Facebook Page and you’ll see a “Mayo Clinic Locations” tab. How’d we build that? Glad you asked! Using Google Maps My Maps, create a map of your locations. You can import a spreadsheet of addresses, which is what I did for our 40+ Mayo Clinic Health System locations. You can also create layers with different pins. I have one layer for Mayo Clinic, showing our locations in Minnesota, Arizona, and Florida, and a second layer for Mayo Clinic Health System. Be sure to include a description. Once your map is finalized, click on the three dots (dot hamburger, traffic light?) to the right of your map’s name and select “Embed on my site” to get the embed code. Warning: You must be a Page Admin or Editor for this step. Create a free Woobox account using your personal Facebook account. When you create your account, you will be asked which Page you want to work on, select your organization’s Page. There are many companies like Woobox that offer this type of service. I researched several and Woobox was the easiest to use and free. Click on Static Tabs in the top navigation, and select HTML Fangate Tab. This gives you a blank slate where you can paste your map’s embed code. Be sure you’re viewing the source code and not in WYSIWYG mode before you paste it. Unfortunately, mobile access to this tab is only available through an upgrade, but desktop users will be able to view it. If you do this and decide to upgrade, let me know what you think! Once you paste your embed code, you can edit the tab name in Tab Settings. 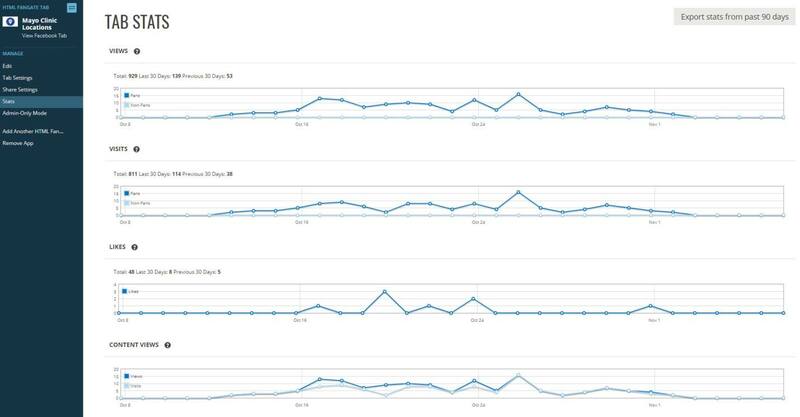 Woobox also provides tab stats, which is a pretty cool feature. Save your tab and voilà, it appears on your Facebook Page! Your new tab will be added to the bottom of your tab navigation bar, so you may want to rearrange them. To do this, go to your Page Settings, and then click on Edit Page. You can drag your tabs to the order you want, and you can also turn off certain tabs you don’t want on your Page. 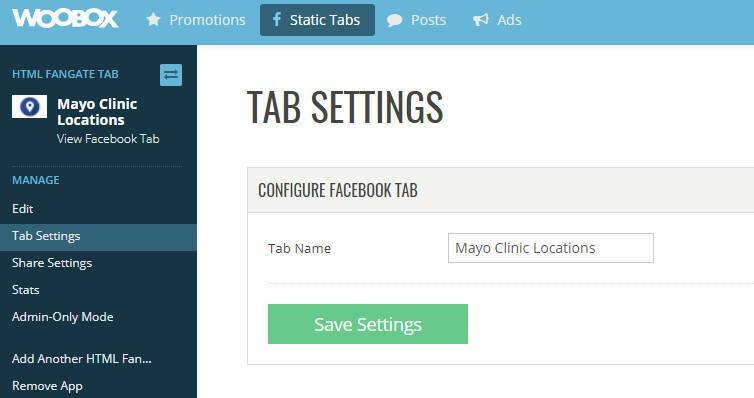 You also have the option to add tabs offered by Facebook, such as Ads, Groups, Jobs, Live Videos, Offers, and several others. So there you go! Let me know if you tried this out (and if I left anything out). What other how-to blog posts would you like to see? Audrey Laine Seymour, a Communications Specialist at Mayo Clinic in Florida, is a member of the Social and Digital Innovation Team. What's the value of the Locations tab on Facebook, anyway? This might look a little complicated, but it can save you a lot of effort in the long run. Ever mapped out all your locations on a Google map? Here's why it might come in handy for you. 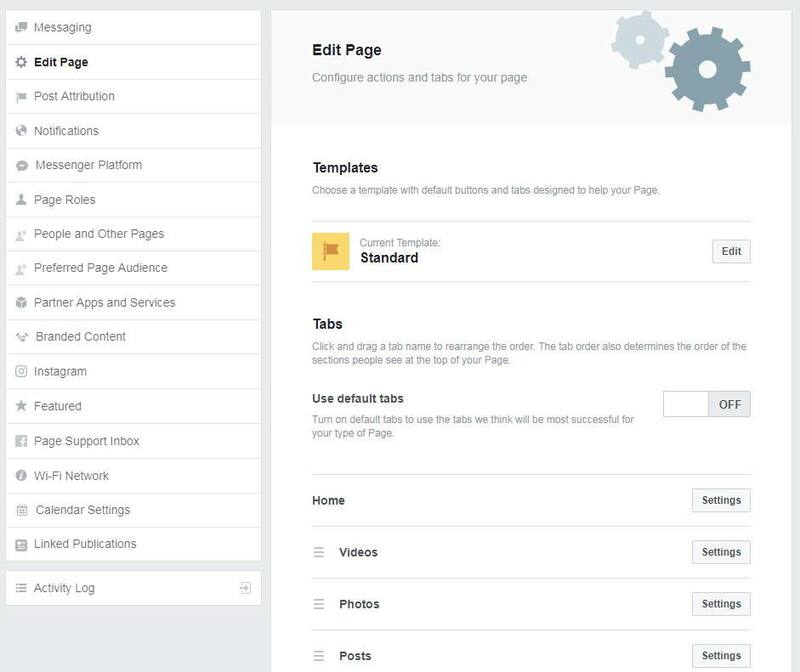 If your organizations has multiple locations, the Locations tab on Facebook lets you localize each branch without having to create a page for each one.